Interesting how National gets so much. 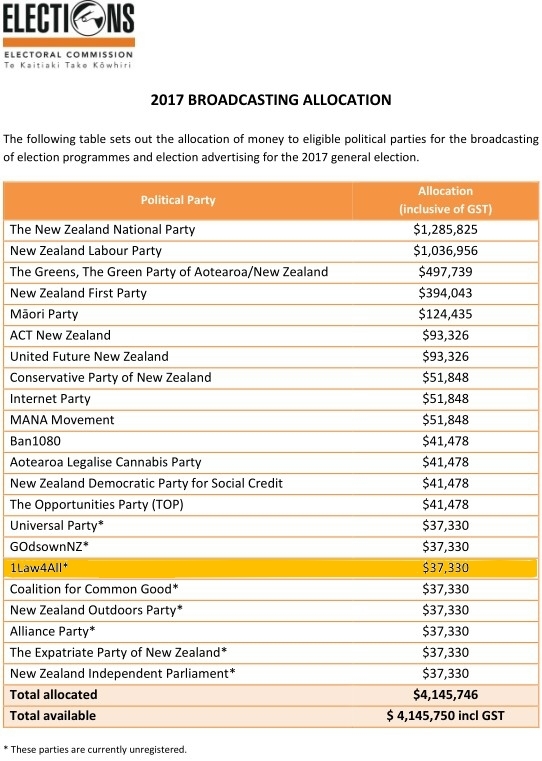 In 2014, private donations gave National a $4 million dollar war chest to sucker NZ voters. So it seems that the system is, ahhh, ‘arranged’ to favour the larger, existing parties. And – of course – only registered political parties actually get the financial support and 1Law4All has not yet re-registered for this year’s general election. and it costs to register and it costs to lodge a party list and it costs for the post-election audits and . . . .
. . . it’s not unreasonable to think that the way things are is intended to favour the status quo. After all, the bigger parties alternating in government get to set the Rules. One doesn’t really expect a sitting Govt to scatter the lollies anywhere else other than at the feet of its supporters. At the end of the day it’s all about retaining power, they’ll tempt us with all the lollies then after the election give the public the finger and carry right on driving us towards 3rd world status, look at the successes Zimbabwe and South Africa have been since the take over. When maori have power it’ll be welcome to New Zimbabwe.